I may have mentioned a time or two that my oldest son is currently obsessed with Spiderman. For mainly this reason I find myself designing in that direction when I have to make a card for a boy similar to his age. Plus, its an excuse for punch art (which I myself might or might not have a mild obsession for). I took inspiration for the cake shape on this card from a card designed by fellow SU! demonstrator, Sharon White. If you aren't familiar with her work, you should definitely check her out! Her punch art is outta this world!! In hindsight (isn't there always a hindsight? 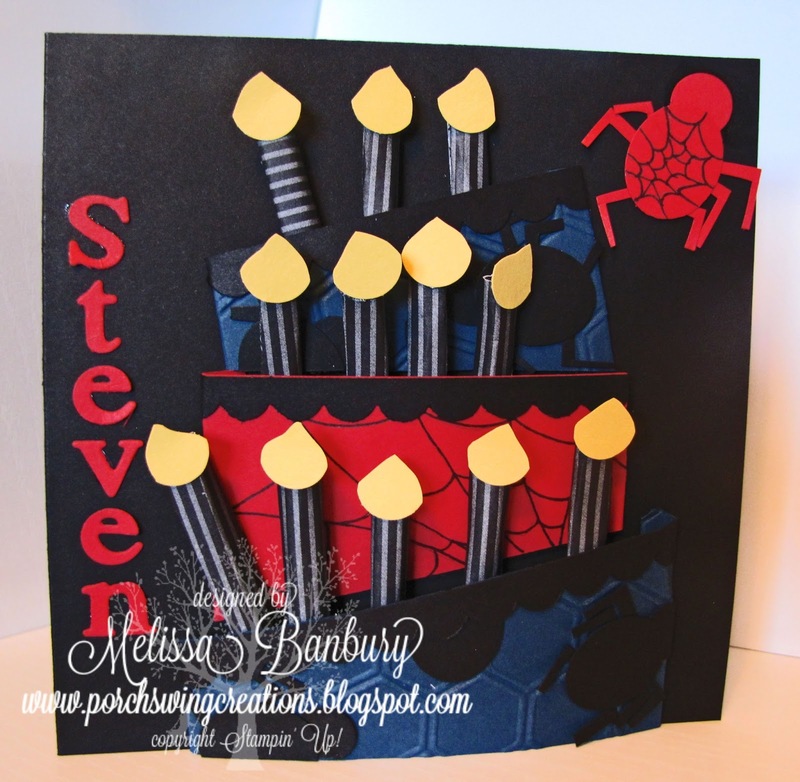 LOL) I wish I had chosen a lighter card base so the cake would have really stood out. The picture doesn't show the 3D aspect of this card very well either. Each tier of the cake is actually raised off the base and each candle is a rolled piece of DSP glued behind each tier layer. I wish I'd taken more pictures, but as usual I was in a hurry to put it in an envelope and get it attached to the gift! Oh well, maybe I'll remember for next time!